For some faith is all there is. Every action, every word, every breath is filled with faith. It is this complete understanding that can result in a high level of clarity, and an overwhelming sense of peace. In some Faiths you can expand your understanding and peace through meditation, which can take on several different forms. It is more then just sitting a certain way and making a silly noise; it is about a focused freedom. It is about expanding your mantra, and releasing everything else. 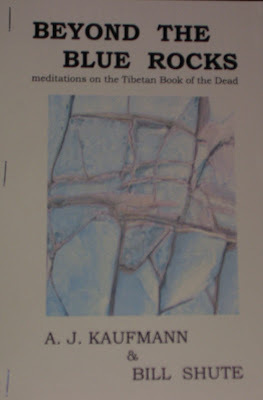 Beyond the Blue Rocks is a set of meditations on the Tibetan Book of the Dead. Yet it is more obtainable and accessible than it may sound. Written by both A.J. Kaufmann and Bill Shute, the collection shifts focus and style rapidly. At its center this collection is about the journey, through life and to faith and freedom. So if you are looking to move beyond or simply find a stronger center, check out this release from KSE. There were only 55 copies of Beyond The Blue Rocks made and I am holding #26, so order yours today.